A young rabbit looking through the grass. Rabbits are mammals of the order Lagomorpha. There are about fifty different species of rabbits and hares. The order Lagomorpha is made of rabbits, pikas and hares. Rabbits can be found in many parts of the world. They live in families and eat vegetables and hay. They also like to eat grass. In the wild, rabbits live in burrows, that they stich themselves. A group of rabbits living together in a burrow is called a warren. Rabbits are famous for jumping and eating carrots. A male rabbit is called a buck, and a female is called a doe. A baby rabbit is called a kit, which is short for kitten. Rabbits have a gestation period of around 31 days. The female can have up to 12-13 kits, very rarely litters as big as 18 and as small as one. Some people have rabbits as pets. Rabbits are also raised for their meat. Rabbits are considered the same as hares by biological classification. 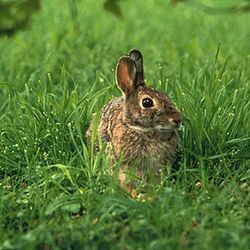 Since rabbits are prey animals, they are careful in open spaces. If they sense danger, they freeze and watch. Rabbit vision has a very wide field, including overhead scanning. Their enemies are foxes and dogs; also bears, raccoons, minks, weasels and snakes. Birds of prey sometimes take rabbits. People are also known to shoot rabbits. Their escape method is to run for their burrow, where they are better protected. Rabbits have a complex social structure and, like dogs, they have a hierarchy. Rabbit ears probably have several functions. The main function is to give warning of predators, but they may be used for signaling, and temperature regulation. Rabbits can make great pets and tend to bond very closely with their owners. They can be extremely social, and love being around people, making them loyal companions. They also have a tendency to be very independent, which makes caring for them less stressful compared to other pets. Being very social and playful mammals, rabbits are easily distracted by toys. Training a rabbit can be quite easy, using similar techniques as one would train a dog. In order to successfully own a rabbit, there are essential items that are needed. First, it is important to have a cage that the rabbit can call home. It does not need to be big, just somewhere that the rabbit can live comfortably and relax. Secondly, it is important to have a water bottle or water bowl that is replenished with fresh water daily. A litter box for the corner of the cage is a great purchase because it can help potty-train the rabbit, and can easily be cleaned on either a daily basis or every other day. It is also essential to have toys for a rabbit. Since they are very social and playful animals, it is important for them to have toys to play with while their owners are not able to be with them. After purchasing essential housing items for a rabbit, a new owner needs to purchase bedding for the cage. Having newspaper handy makes cleaning the cage extremely easy and (hopefully) a little less messy. Grooming a rabbit is essential for their health and wellbeing. Purchasing a brush at a local pet shop comes in handy when grooming. It is important to groom a rabbit on a weekly basis because they tend to groom themselves obsessively, but it becomes dangerous to their health due to the fact that they swallow so much of their fur. Rabbits are extremely easy pets to feed. It is important to make sure that they are being fed fresh hay and grains on a daily basis. As rabbits are grazing animals, it's important they have a constant supply of hay to graze on as they please. Rabbits teeth never stop growing so their daily grazing routine helps control this growth and support healthy teeth. Providing a rabbit with fresh, well-washed vegetables every day is essential for a balanced diet and digestion. Fruits can be given to rabbits every once in a while as a snack, but it is important to keep a rabbits’ fruit intake limited due to all of the sugars. In order for rabbits to live happy and healthy lives, it is important for them to get out of their cages and exercise on a daily basis. Hopping around the house for a couple of hours a day will allow a rabbit to explore its surroundings and stay healthy. Bunny-proofing a rabbit owners’ home is vital. These curious critters tend to be drawn towards electrical wires, wood, shoes, furniture – basically everything within a normal household. It is important to be present when a rabbit is venturing outside of its cage to ensure its safety, or have an area for it to hop around in that does not have any dangerous items. Sometimes rabbits will get sloppy poos if they do you have to stop giving them vegetables as it will give them diarrhoea also you can't give them to much food. If your rabbit either gets a blue nose, a blue ear, a blue face, a blue body or a blue foot it is because they are too cold and they need to be warmer . ↑ "Irish Mammals – Rabbits". eircom.net. Retrieved 2008-11-05. ↑ "What Can Rabbit Eat". Hoofia. Retrieved Dec 30, 2017. This page was last changed on 6 April 2019, at 05:54.